We offer morning preschool sessions throughout the week for children aged 3-4 which run from 9.00am until 12.30pm. The preschool sessions include a healthy, home-cooked, 2-course lunch. Special diets can be accommodated. Most children are eligible for Nursery Education grant in line with current government policy. Our Rising 3s sessions are for children from the age of 2 and are held in the afternoons from 1.15pm until 3.45pm. 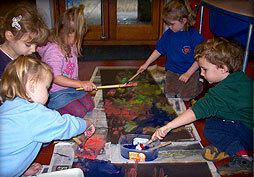 Some of the children who attend these sessions benefit from ‘Achieving 2 Year Olds’ funding.